Bison found a haven within Yellowstone. In 1872, when President Ulysses S. Grant created the world’s first national park in the Yellowstone Valley of Montana, his goal was to protect some of the nation’s most spectacular scenery and create a safe haven for wildlife. His foresight would soon be rewarded, for hiding within Yellowstone’s spectacular mountains was the last wild bison herd left on Earth. By the 1890s, however, the herd was threatened with extinction from poachers. In 1894, after park rangers could find only 20 remaining bison, Congress quickly passed a law that called for fining and imprisoning poachers. But the herd remained small. In 1902, there were still just 23 animals. That finding worried scientists concerned about the fate of the buffalo. Several prominent researchers, including William Hornaday of the New York Zoological Park (now the Bronx Zoo), began a campaign to rebuild wild herds. 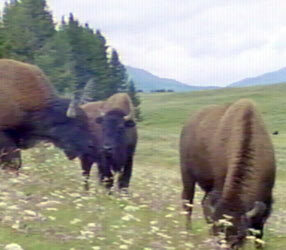 In 1902, bison from two ranched herds were released into Yellowstone to bolster the population. Then, in 1905, Hornaday sent a dozen bison from his zoo to a new, 8,000-acre reserve in Kansas established to restore a buffalo herd. In 1906, with help from President Theodore Roosevelt, Hornaday and others founded the American Buffalo Society, which spearheaded efforts to recreate more wild herds. Bison found a haven within Yellowstone. Today, the results of Hornaday’s labors can be seen in Yellowstone, which is now home to more than 2,000 free-roaming bison. Other smaller herds can be found on ranches around the nation and in Canada. Together, they total more than 200,000 animals. Despite its inspiring comeback, however, the Yellowstone herd has become enmeshed in several heated debates over how the park’s wildlife should be managed. One involves efforts to reintroduce wolves — one of the bison’s few natural predators — back into the park. Though more than a dozen of the efficient hunters were successfully released into the park several years ago, adjoining farmers have successfully sued to force the National Park Service to remove the wolves, claiming that they threaten livestock. For the moment, however, the wolves remain, awaiting the results of an appeal. The other controversy involves the bison more directly. It has its roots in a 1917 discovery that some of the wild bison carry Brucellosis, a bacterial disease that causes miscarriages in cattle. Though scientists have never documented a case in which the bison have transmitted Brucellosis to cattle on ranches adjoining the park, ranchers are allowed to kill any bison that leave the park each winter in search of food. 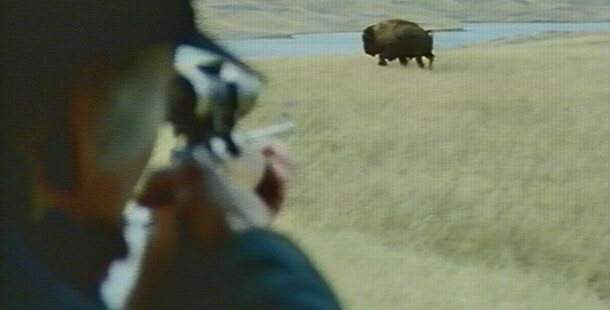 In the winter of 1996, the practice became the subject of international protests when stockmen killed more than 1,000 bison — over a quarter of the total herd at that time. Environmentalists and Native American tribes oppose the killing, saying alternatives exist. One, for example, would be to move bison that have left the park to lands owned by native tribes interested in rebuilding their own herds. So far, however, Montana and federal government officials have remained firm in their belief that the modern buffalo hunt is the best way to reduce the disease threat.